Mandatory Information – Please read/watch carefully! Please review all of this information in this cooking instruction packet PRIOR to the Cook-Off. If you have any team questions, please call Bill Friedmann, the 2018 Team Chair at 610-633-5444. 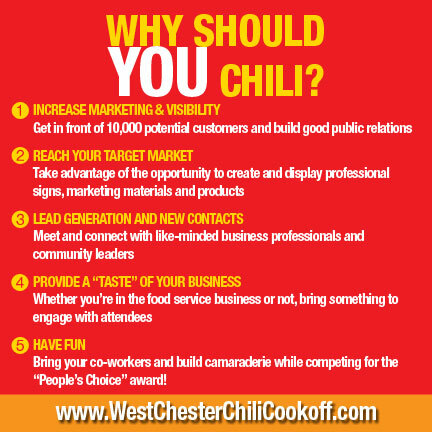 Email questions anytime to info@westchesterchilicookoff.com. Everyone needs a chili tasting wristband to sample each team’s chili at the Cook-Off. If you want to buy extra wristbands for your team, employees or family members, they can be bought online at www.westchesterchilicookoff.com or on the day of the event at a Cook-Off sales booth. NO ALCOHOL AND NO PETS. This will be strictly enforced by local police. THIS IS A RAIN OR SHINE EVENT. NO RAIN DATE. No refunds will be given to teams who do not show up to cook. You will be notified before Sunday, if there will be any changes to the location/setup of the Cook-Off. FOR THE GENERAL PUBLIC: ROAD CLOSURES OCCUR FROM 7AM – 6:30PM ON GAY ST. FROM WALNUT TO NEW. The following streets between Market and Chestnut Street will be closed throughout the Cook-Off: High Street, Church Street, and Darlington Street. DECORATING YOUR BOOTH. Teams are encouraged, but not required to create a theme for your team and decorate your booth space. First, Second and Third Prize will be awarded. Cash prize for first place. If First Aid is needed, go to the nearest Rotary Sales booth. EMS is onsite at the Cook-Off. Two Chili Tasting Wristbands – to taste other teams’ chili. Two 2015 Chili Shirts. Any extras will be on sale at the Cook-Off in the Ticket Booths. Tasting cups, spoons, napkins and (qty 2) 2oz. serving ladles will be supplied by Rotary. Please Do Not Throw Away Any Extra Cups and Napkins. Rotary will pick them up when you are cleaning up. A Cooking Thermometer to ensure (per the CC Health Dept.) that your cold food is at or below 41 degrees and hot food (chili) must be maintained or above 135 degrees. Two (2) plastic tablecloths to cover the tables. One Vehicle Pass for Set-up – This will be emailed to you. Only one vehicle per team or vendor will be allowed on Gay St. during the set-up hours of 7:30am-9:30am. NO Car Entry after 9:30am, streets will be closed to traffic. Peoples’ Choice Voting Buckets – The tasting public will receive Three Wooden Nickels for voting with each wristband purchased. The chili team with the most Wooden Nickels wins the Peoples’ Choice Award at the end of the competition time. All voting will stop at @ 3pm when a Rotarian will collect your wooden nickels. This is where you want to encourage your friends, families and customers to come out and vote for you. YOU WILL NOT BE ABLE TO COMPETE WITHOUT A TENT. This is mandatory from the CC Health Department. We offer a tent package that includes a tent, 2 tables and 2 chairs. Tent package payment must accompany your registration payment. The tent package cost is $75 (includes the rental of 1 tent, (2) 8ft. tables and 2 chairs). All items will be delivered by 7:30am to your team’s cooking location on Gay St.
Decorations – There is a contest for Best Decorated Theme Booth. Many teams tie their chili name, clothes and decorations all together. This is not mandatory, but a lot of fun. Awards for 1st, 2nd and 3rd place. $250 Cash prize for First Place. A Method to Cook Chili up to 165° F – Gas Range or Propane Stoves (Be sure to bring extra bottles of propane). Electric Crock Pots are not permitted as a result of past electrical problems. Gas ranges can be rented from All Event Party Rental or other outlets. They must be delivered before 9:30am as Gay Street closes promptly to all traffic. Please let us know if you will be having a range delivered so it is reflected on our check-in sheet. Reserve Your Rental Equipment early, the rental gas stoves book up quickly. A Simple Hand Washing Station – A 5 gallon container with spigot filled with potable warm water (90 to 100 degree Fahrenheit (F)) , a dispenser with Liquid Soap (NOT HAND SANITIZER), a roll of paper towels and a basin for catching rinsing water. Bottled Water – Water must be bottled if you plan to add it to your chili. Also useful for thirsty cooks and servers! Cutting Boards, Knives and Can Opener (if necessary) – Do not leave these unattended in your booth, please. If any cuts happen, EMS is onsite and each Rotary Sales Booth (located at the intersections) will have first aid supplies. Long Stirring Spoons (or a paddle) that reach the bottom of your chili pot! Constant stirring and low heat should prevent burning your wonderful chili at the bottom of the pot. Trash Can with trash bags – You are responsible for removing your trash. Please have a method to contain your trash. We will have a dumpster available for disposal. The Rotary Club of West Chester and the Borough greatly appreciate your support. Portable Fire Extinguisher – Better safe than sorry! “Chester County Department of Health Requirements for all Participating Teams”. Set-up begins at 7:30am and teams must complete delivery and set-up by 9:30am. One vehicle per team will be allowed on Chili Cook-Off grounds during set-up time. Street parking is free on Sunday. Also Public Garages are available nearby, locations and directions are on the website. The week before the event you will be notified of your booth location and your access route to enter Chili Cook-Off grounds. Place your parking pass in the window of your car. You will be greeted by a Rotarian on Gay Street, he or she will direct you to your assigned booth location for set-up. You will be met by your Rotarian who will be your liaison and available for any questions throughout the event. Please unload your tent, tables and supplies as quickly as possible and then exit and park your vehicle BEFORE 9:30am. Please follow the Rotary’s exiting instructions that morning. Walk back and Set-up your booth after you have parked your car. There are several free parking lots nearby. If you are in need of assistance during the day contact your Rotary Block Captain or go to any Wristband Sales Booth. If you rented a tent, tables and chairs from Rotary, please breakdown only the tables and chairs and the rental company will come by with their truck to load up after the award ceremony. Clean and sweep your area. Please bag and leave your tied-up trash at the curb. If you run out of trash bags, check with the Rotary Sales Booth at each intersection for extra bags. Award Ceremony will be at @ 3:30pm at the center stage at Gay and High Streets. A mandatory Chefs’ meeting will be held at 9:30 am on the day of the Cook-Off at the judging area (TBD). All teams MUST have at least one team member attend this meeting. JUDGING CUPS WILL BE HANDED OUT AT THE CHEFS’ MEETING. IN ORDER TO COMPETE FOR CHILI AWARDS YOU MUST HAVE AN OFFICIAL JUDGING CUP PROVIDED BY THE ROTARY CLUB OF WEST CHESTER. Also bring a copy of your recipe. You will receive updated information on the rules, procedures, and location of the judging area. Please feel free to ask any questions. Restaurants and Non-profits that have a Chester County Health Department License to Operate a Public Eating or Drinking Place can bring pre-made chili from their facility on Cook-Off day. If just preparing chili you are not required to purchase a Temporary Health Department License, as the Rotary Club of West Chester attains one for the whole event. Restaurants and Non-profits (or Businesses or Hometown Cooks who team with a facility) with a CCHD License to Operate a Public Eating or Drinking Place are not required to cook on site this year. Please submit this license at the time of registration, so it is on file prior to the Cook-Off. If you are unsure of your status, contact Rotarian Francis Curtin at (484) 880-2239 or fhcurtin2@gmail.com. Teams will compete in separate divisions. Restaurant, Business, Non-Profit, Rotary Club or Hometown Cook. All teams, except for restaurants and non-profits with a food-handling license, must prepare a chili from scratch at their booth for judging. All teams can begin cooking your chili as soon as your team is set up. All Teams must read and abide by the Rules of the Chester County Health Dept. as posted and titled, “Chester County Department of Health Requirements for all Participating Teams”. Before you begin serving to the public at noon, fill your Official Tasting Cup and bring to the Judging Area. You will then begin giving away the rest of your delicious chili to the tasting public. Please use the ladles and our tasting cups provided so they are not overfilled. Judging – Each team will be supplied with an Official Tasting Cup with your team number on the bottom. Do not alter the cup in any way as this is a BLIND tasting. You will deliver your filled cup to the judges where it will be placed on the judging tables in random order. It will NOT be moved until judging is completed, so no judge will know which team is which when scoring your entry. Only the Judging Committee will have the Master List of which team number matches the cup on the Judging Tables. Awards will be given to 1st, 2nd and 3rd Place. Cash prizes will be given away to the People’s Choice Winner as well as the First Place winner in each division. Remember – Peoples’ Choice Award is given to the Chili Team that receives the most votes via the Public’s Wooden Nickels placed in the orange bucket. Teams that make more chili traditionally acquire more wooden nickels so we encourage you to cook more than the minimum requirements. At 3pm, we will pick up and count nickels for the Peoples’ Choice tabulation. If you leave before this time, please bring your pumpkin bucket for counting to the Judging area. We will also be giving 1st, 2nd and 3rd place awards for the Best Decorated Theme Booth. Be sure to carefully clean up your area. The streets must be as clean as when you arrive. Return Serving Ladles, thermometer, unused cups, spoons and napkins to Rotary Sales Booth at Church and Gay St. before leaving the Cook-Off, please. Please email us or call us with any questions, we’re here to help. Thank YOU! Please bring disposable food service gloves for all members of your team that will be preparing or serving chili. In accordance with Subsection 46.261(b), “Except when washing fruits and vegetables food employees may not contact exposed, ready-to-eat food with their bare hands, and shall use suitable utensils such as deli tissue, spatulas, tongs, single-use gloves or dispensing equipment.” Once your chili is cooked you should not have any hand contact with food without gloves. When you wear Gloves: Wear Gloves the Right Way! Change your gloves anytime you would need to wash your hands. Any Cook-Off food not prepared on-site must be prepared in a CCHD licensed facility. Any meat used in the preparation of Chili and/or served to the public must be USDA inspected. It cannot be from a local farmer, or from your own farm or wild game (see §.46.221 of the Food Code). Only chili may be prepared on site, except, if you are a vendor with your own Temporary License to Operate a Public Eating or Drinking Place. Mixing a drink, such as, juice and seltzer on site is considered preparing a food and is not allowed without a License. Chili toppings such as cheese must be purchased from a commercially licensed facility. Potentially hazardous foods must be maintained at safe temperatures (41°F or less, or 135°F or greater), throughout the entire Cook-Off. Each participating team will be provided a stem type thermometer to measure refrigeration or cooler temperatures, heated holding temperatures and internal food temperatures. These temperatures must be routinely checked. eg. Keep your perishables in a cooler of ice and have a heat source, such as, propane to keep your cooked food hot. A Rotarian will come to check on these temps. All unpacked or unwrapped food must be protected from dust, dirt and droplet contamination and protected from flies and other vermin. eg. Plastic bags work well. Single service articles (e.g. paper plates, plastic utensils) must be packaged stored and handled in a sanitary manner and shall be used only once. The Rotary Club will be providing chili tasting cups and spoons for you to give to the public. All water used in the operation of a Public Food Service Facility must be from a source approved by this Department. Since individual interviews will not be done with each booth as would be done for individual licenses, only West Chester Borough or commercially bottled water may be used for food preparation, hand washing, or warewashing. Bring 3 or 4 gallons of bottled water. Utensils and food-contact surfaces of equipment shall be sanitized before use and after cleaning. Bring a sanitizing solution and clean towels or paper towels. Rotary will maintain two Sanitizing Stations at the event. If any equipment such as utensils should become contaminated bring that item to the station for sanitizing. after smoking and after using the toilet. No persons shall be allowed to work in situations in which they could contaminate food if they have signs or symptoms of gastrointestinal infections (diarrhea or vomiting) or obvious infections of the skin (boils or any seeping scratches or wounds, especially of the hands or forearms), or signs or symptoms of upper respiratory tract infections (sore throat or nasal congestion other than from allergies). This event is a no pets events. Please leave all pets at home, at no time are pets allowed in the booth or food service area. In 1993, the bacteria, E. coli, was implicated in a large outbreak in the Pacific Northwest during 1993. This outbreak resulted in five deaths and over 500 individuals becoming ill. Undercooked hamburgers were identified as the source of the E. coli bacteria in this outbreak. A majority of the recent E. coli outbreaks have also involved the consumption of undercooked ground beef. 145° F or above for 15 seconds for either fish, meat, pork including game animals commercially raised for food as specified in § 46.221 (a) that are not comminuted. Members of the Rotary Club will be assisting you with checking temperatures. Any food vendors (not teams cooking chili) who operate consequential to the event would need to be licensed consistent with the other events held in West Chester Borough. The vendor would need either a Temporary License to Operate a Public Eating or Drinking Place, or a License to Operate a Mobile Public Eating or Drinking Establishment. If you need a Temporary License, applications for such vendors must be submitted within five (5) working days of the Chili Cook-Off. For Health Department questions contact Francis Curtin at (484) 880-2239 or fhcurtin2@gmail.com. If you have team/cooking questions please call Bill Friedmann at 610-633-5444, or email him at teams@westchesterchilicookoff.com.